Today, I came across a program known as 7stacks. 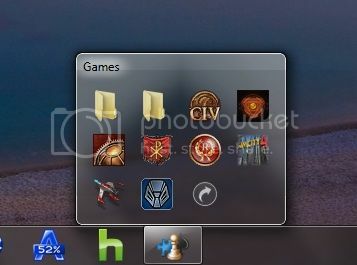 It is an easy to use, freeware that lets Windows 7, Vista and XP users to have “stacks” of icons. In Windows 7 stacks appear in the taskbar and in Windows XP and Vista stacks appear in the QuickLaunch Toolbar. So what’s the use of stacks? By using stacks, users can reduce icon clutter, and combine a group of related icons into a single icon. If programs like Yahoo messenger, Google talk, and msn messenger are open then they all will be grouped under one stack in the taskbar. It also allows you to browse and access documents within a folder very quickly. Usually, when you want to edit a series of frequently used documents, you’d have to either launch the app and go to My Computer icon> My Documents folder and then pick the file you want. With 7stacks, just create a stack to that document’s folder, and open that document in a couple of clicks. Pretty easy isn’t it? -In 7 and Vista, 7stacks uses Aero, making the stacks look like part of Windows itself. -Browse subfolders within a stack, just like in OS X Snow Leopard. -Normal displays a stack of icons vertically, with a text description next to it. -Grid displays a “squarish” grid of icons only; useful when displaying a large number of items like document folders. 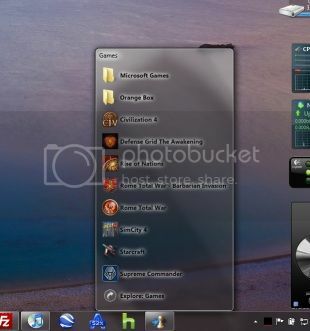 -Menu displays a cascading menu of items, with a very small icon and a name next to it. Hover over subfolders to browse inside those folders. -In Windows 7, create a new stack by right-clicking on any stack and selecting “Create New Stack” from the JumpList entry. -In Menu mode, 7stacks doesn’t even need to be in a toolbar. You can use it right from your desktop, or any other folder.